By now you should be fully aware that on May 20, 2016, FDA released mandatory nutrition labeling revisions. 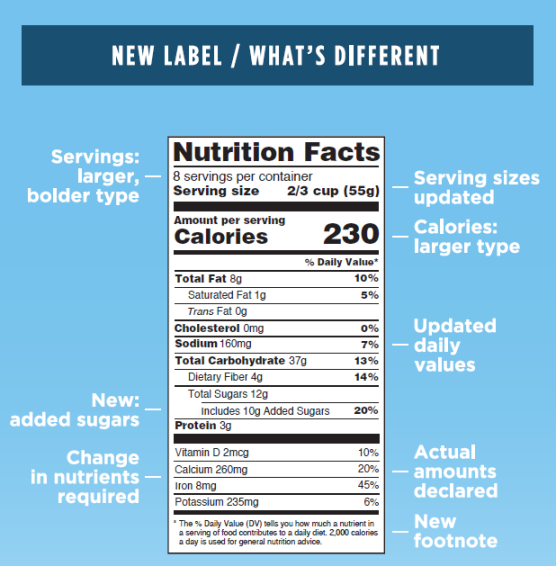 FDA made changes to the content and format of the Nutrition Facts label as well as to the reference amounts that determine the serving sizes of conventional foods. The compliance date for manufacturers with more than $10 million in annual food sales is July 26, 2018. For manufacturers with less than $10 million in annual food sales, the compliance date is July 26, 2019. 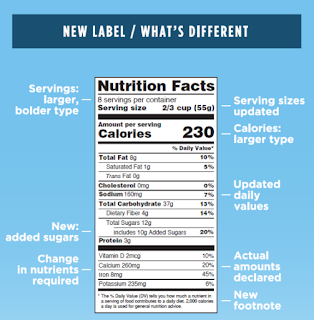 “Food Labeling: Revision of the Nutrition and Supplement Facts Labels.” This rule revises FDA regulations to provide updated nutrition information on the label and improve how nutrition information is presented to consumers. “Food Labeling: Serving Sizes of Foods That Can Reasonably Be Consumed at One Eating Occasion; Dual-Column Labeling; Updating, Modifying, and Establishing Certain Reference Amounts Customarily Consumed; Serving Size for Breath Mints; and Technical Amendments.” This rule defines a single-serving container; requires dual-column labeling for certain containers; updates, modifies and establishes several reference amounts customarily consumed (RACCs); amends the label serving size for breath mints; and make technical amendments to various aspects of the serving size regulations. One of the biggest changes taking place is with the carbohydrate category. For the first time, the label must declare “added sugars,” and “sugars” now will be declared as “total sugars.” The value for total sugars will include all naturally occurring sugars, such as lactose in milk, and added sugars. No Daily Value was set for total sugars; however, for added sugars, it is 10% of calories, or 50 grams for adults and children over four years of age. There are numerous other Nutrition Facts modifications that will be required because of changes in the Daily Value for fat, sodium, fiber, and select vitamins and minerals. THIS WILL IMPACT MANY NUTRIENT CONTENT CLAIMS. Then there’s the changes made to serving size, because after all, who really eats only a half-cup of ice cream in a sitting? When making these serving size changes, FDA used various sources of data to determine the “Reference Amount Customarily Consumed” (RACC). The FDA amended the serving sizes for ice cream and frozen desserts, including frozen novelties from a half cup to two-thirds cup, (5 fluid ounces). Initially, FDA proposed an increase to one cup. Thanks to efforts by IDFA, the agency reevaluated the decision tree used to determine the serving size, and agreed that two-thirds is more reasonable than a full cup. For yogurt, the serving size dropped from 8 ounces to 6 ounces, to better reflect current pack sizes in the market. This request came from the yogurt industry. The final rule stated that this serving size also applies to drinkable yogurt, which for some marketers, may not be a favorable change. FDA did clarify; however, that “smoothies,” including blends of fruit with yogurt, milk or ice cream, are included under the category of “shakes and shake substitute, e.g., dairy shake mixes, fruit frost mixes.” This category has a serving size of 8 ounces. So, for all those drinkable yogurt marketers in 8 ounce bottles, you might want to consider a product description change, reformulation or package size reduction. FDA’s final rule did not make any serving size changes to other milk, cheese or dairy products. Processors should be aware that the RACC changes for ice cream and frozen desserts, as well as yogurt, may have an impact on the nutrient content claims currently used on labels, according to Frye. So, if you had a package of three 3-ounce ice cream mini-bars, the package would have to be labeled as one serving of three bars, for a total of 9 fluid ounces, listing the nutrition information for the total of the three bars. The marketer can voluntarily also provide the nutrient information per single 3-ounce bar. Single-serve units is where things get complicated. A big thank you to Cary Frye for this explanation. All containers with less than 200% of the RACC will now be labeled as a single-serving container, resulting in more products labeled as containing a single serving. This change removes the current flexibility for products such as fluid milk with “large” RACCs (of 100 grams or milliliters or larger), under which manufacturers may decide whether a package that contains more than 150 and less than 200 percent of the RACC be labeled as one or two servings. For example, currently a 14-ounce container of milk could have been labeled and provide the nutrient information either based on “one serving” or “approximately two servings” per container. Such products with less than 200% of the RACC, such as a 14-ounce container of milk, must now be labeled as one serving and provide the product’s nutrition information based on the entire single serving container amount. In order to assist IDFA members with making the necessary changes to product labels, IDFA will be providing detailed information about what changes are needed for dairy products in a soon-to-be-issued comprehensive “IDFA Regulatory Update” reference guide. The association will also offer webinar training for the industry in August and repeated in September that will cover information on each element of the changes. Additionally, IDFA will be updating their labeling manuals with the new regulations. Thank you IDFA for assisting with this expensive and time-consuming labeling overhaul. Are your products e-shopper friendly? There’s no denying that online grocery is rapidly growing and it’s having a major effect on the dairy industry. 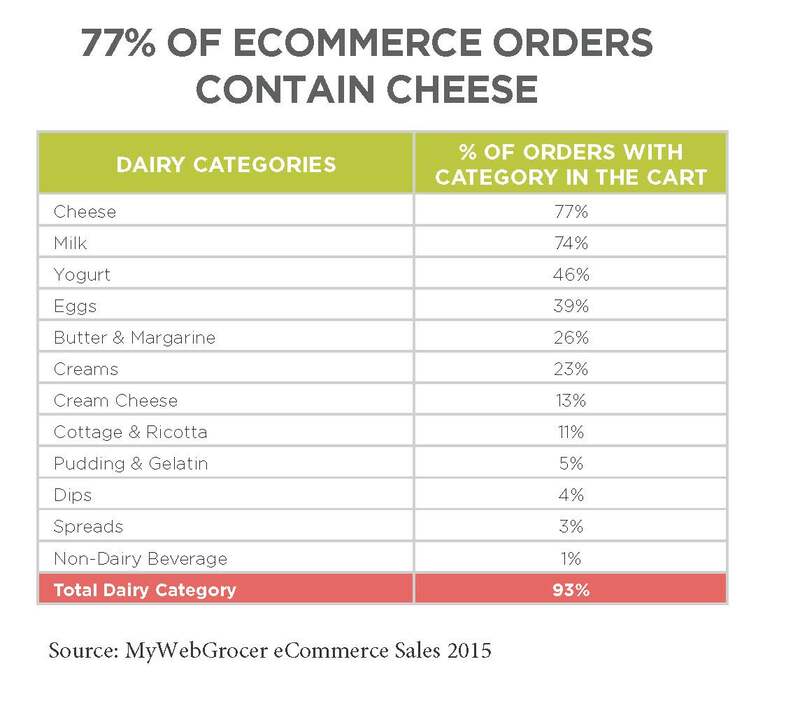 In 2015, dairy category sales accounted for 15% of eCommerce sales, according to MyWebGrocer. 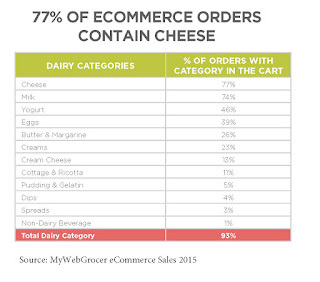 In fact, dairy products were included in 93% of all carts, which was 8% more than the next most popular category (produce). The propensity of online shoppers to buy dairy products makes them an increasingly important audience for all dairy brands. MyWebGrocer, a leader in digital grocery services, has compiled The Grocery eCommerce Index for dairy based off of its data, which provides extensive insights into consumer habits. For example, online milk sales soared 24% in 2015. In contrast, Information Resources Inc., reported that overall retail milk sales declined 5.2% during the same period. Online grocery shoppers are also proven consumers of cheeses. Cheddar and mozzarella accounted for more than 50% of online cheese sales in 2015. “Online grocery platforms provide a terrific opportunity for dairy brands to leverage shopper data and analytics, to run campaigns that drive sales,” according to Michelle Cote, vice president of data and insights at MyWebGrocer. “With the expanding capabilities of eCommerce and mobile marketing tools, dairy brands can effectively engage online shoppers, even while they’re making in-store purchases. 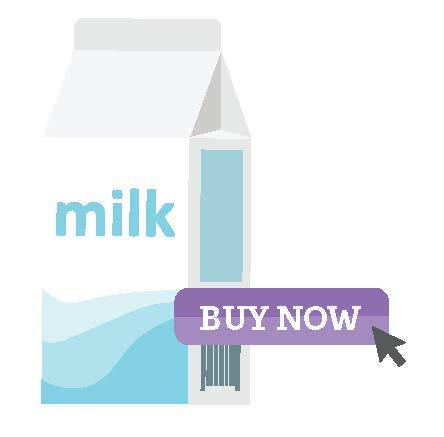 Reaching customers at the point of purchase is critical to a dairy brand’s eCommerce success. There’s a misconception in the market that shoppers don’t buy perishable items online; however, this is not the case. 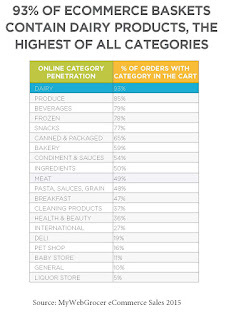 Grocery shoppers do buy dairy products online. 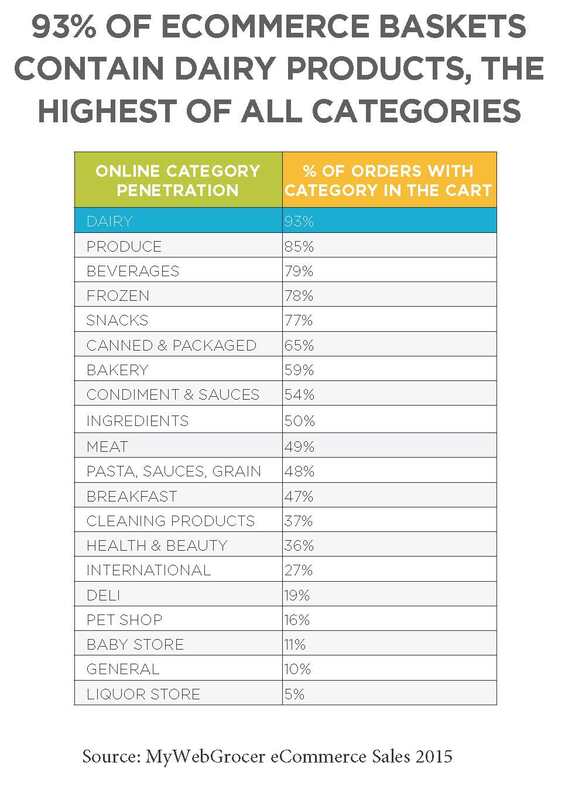 For the millions of consumers who use online grocery, dairy products make up the largest category they purchase. According to the study, online shoppers are boosting their purchases of all dairy products. The largest-selling dairy product categories—milk, cheese and yogurt—all posted impressive sales gains of between 20% and 24% in 2015. If the trend continues, dairy products could account for an even larger share of the online grocery pie. 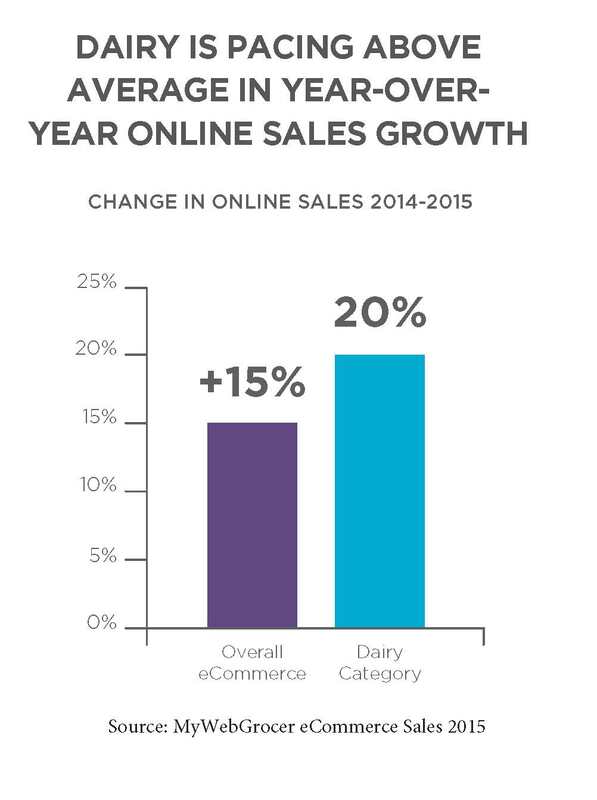 Last year, online dairy sales soared +20%, well above the +15% sales gains posted for all online grocery purchases, according to MyWebGrocer. The culinary curiosity of online grocery shoppers makes the eCommerce platform a reliable proving ground for brand extensions or new products, according to Cote. Because online shoppers are clearly open to trying foods that are new to them, dairy brands can quickly determine the viability of product introductions. Online sales data can then be used to negotiate valuable in-store shelf space with grocers. It’s time to up your game to make your products are getting into the eBasket. By all accounts, it’s looking like IFT 2016, the annual meeting and food expo of the Institute of Food Technologists to be held in Chicago July 16 to 19, will be all about protein this year. From insects and pulses to chickens and cows milk, isolated protein ingredients will be showcased in all types of foods and beverages, including inherently nutritious dairy foods, which are attractive delivery vehicles for dietary components with recognized health and wellness benefits. 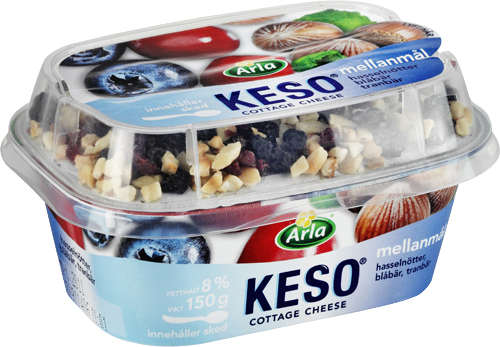 Portion control and portability make many dairy foods attractive snacking options for today’s mini-meal consumer. Such convenience foods—namely cheese, yogurt, drinkable dairy and even ice cream—can be formulated to offer a nutritional profile—higher in protein content--that appeals to consumers, while these value-added products command a premium price, making them attractive to both manufacturers and retailers. 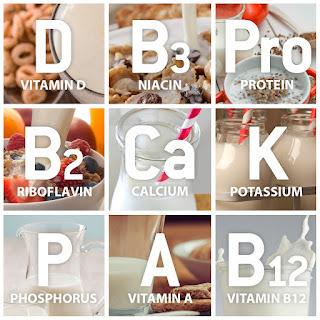 To read an article I just wrote entitled “Functional dairy foods—beyond basic nutrition” for Food Business News, link HERE. The article discusses the opportunities in boosting the protein content of dairy foods, along with adding other functional ingredients. 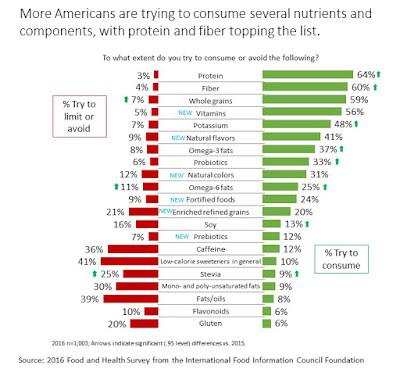 According to the hot-off-the-presses 2016 Food and Health Survey from the International Food Information Council Foundation, 64% of Americans are seeking out protein in the diet, a statistically significant increase compared to 2015. 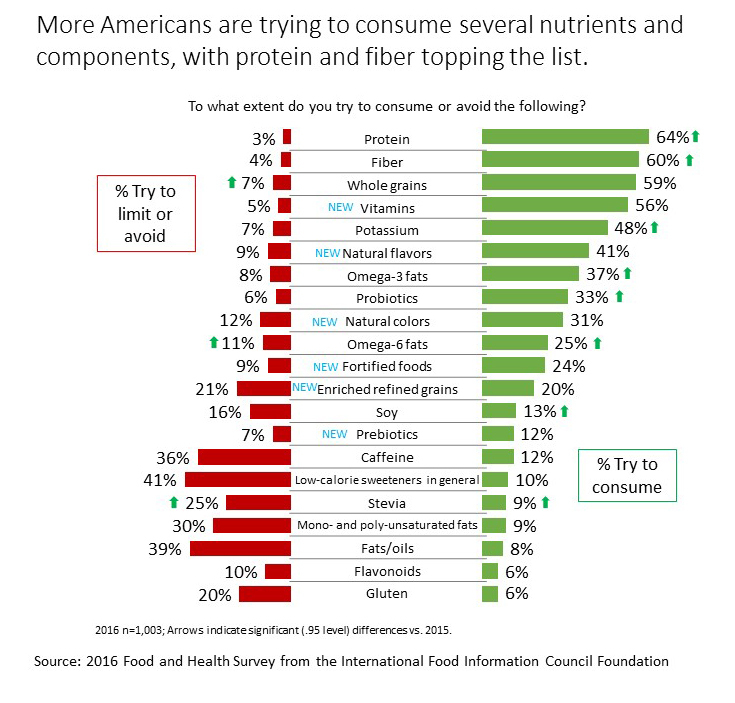 Dairy foods are an inherent source of what most Americans want more of: protein! Did you know that every ounce of fluid milk contains one ounce of protein? Depending on the product and processing, the inherent protein content of dairy foods can be concentrated. Further, adding additional protein to dairy products in the form of milk protein concentrate, nonfat dry milk or whey, for example, can further boost protein content. Many consumers know the general benefits of protein, but a majority are unaware that not all proteins are created equal. Dairy proteins offer benefits that make them a higher-quality option than plant proteins. Protein has also historically often been consumed only at certain times of the day, primarily at dinner. However, it’s important that high-quality proteins, such as those from dairy foods, are consumed throughout the day in order to meet recommended protein intake amounts. Therefore, consumers look for snack items to increase their protein intake between meals and often use them as meal replacers. Finally, baby boomers are the second-largest generation and many plan to spend their savings on health and wellness consumer goods to extend their independent lifestyles. They are living longer and staying more active as they age, so it’s important they consume the right protein at the right times to help maintain muscle mass, strength and functionality. Dairy foods can deliver. Plan to attend these sessions while you are at IFT. #84 Promoting Protein in Your Products: What You Need to Know, Tuesday, July 19, 8:30am to 10:30am. Session overview: Consumer demand for protein continues to be strong and the food and beverage industry recognizes the value of formulating products with protein. However, there is some confusion among the industry and consumers, alike, regarding role of protein in support of health and how information relative to protein can be communicated on packaging. Protein plays an essential role for health and should be included in the diet every day. Consumers are increasingly turning to food to support health and associate protein with areas of interest including weight management, building muscle, maintaining cells, immunity and energy. There are other areas where evidence is emerging to demonstrate the potential role of protein, including risk factors associated with cardiometabolic disease. The first presentation will address the importance of daily dietary protein intake and how protein can not only meet basic needs but also support improved health. In addition, Joanne Slavin will discuss current knowledge on the state of the science around different protein sources, as there is growing consumer awareness of alternative protein sources. The second presenter—Glenna Hughes--will address an area of current confusion that exists today in the food industry by discussing the different ways the consumer packaged goods companies can inform consumers of the protein content of products. From Nutrition Facts panel to front of pack labels, she will discuss the sources of data and methods that are currently available and approved for use in informing statements on packages. Practical advice for how to apply protein quality, amino acid reference values, nitrogen conversion factors and available resources for each will be conveyed. As available technology improves and the state of the science evolves, methods for assessing protein quality have also changed. The final presenter—Robert Burns--will discuss changes that have occurred over time in methods and policies that incorporated those methods. While the U.S. does not face an immediate change in policy related to protein quality evaluation, there is change on the horizon. He will discuss how those changes may impact the food industry and the potential timeline for incorporation and adoption in global policy and regulations. #106 Formulating With Proteins: Understanding Effects of Protein Blending, Tuesday, July 19, 1:15pm to 2:45pm. Session overview: Proteins play an important role in the food for their nutritional value and their functionality through molecular interactions with other components in the system, leading to desired texture and flavor. Dairy, meat, egg, and soy proteins are currently the most used protein ingredients in the market. Due to allergenicity, cost, and processing challenges, there is a growing interest in other protein ingredients from plant sources. Academic researchers and industry scientists are currently investigating the effect of introducing novel plant protein ingredients to different food formulations. This session will highlight this need, and describe current challenges. Topics covered in this session will include effect of blending proteins from different sources on functionality, and will highlight molecular interactions. Speakers from industry, research institutes and academic universities will share insights and research findings. Talks will focus on industry needs from the ingredient developer and the formulator perspective, and on functional synergy upon blending proteins from different sources. At IFT, USDEC will highlight a number of higher-protein prototypes, including a cottage cheese mango dip (pictured). Many of the prototypes are global inspired and on trend with consumers’ desire for bold, adventurous flavors. 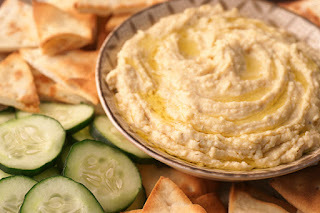 Dips attract the many millennials who mix flavors to spice up popular everyday finger foods with unique tastes. U.S. dairy ingredients aid in this evolution by offering flavor, functionality and nutrition. Globally, 67% of consumers want to recognize ingredient labels and 40% say simplicity is key, according to USDEC. The prototypes at IFT will be made with few ingredients that are recognizable to most consumers, including dairy proteins, cheese, Greek-style yogurt and permeate. They will offer the health benefits and nutrition often looked for in snack products. A recent beverage prototype from Ingredia won the Healthy Lifestyle award at Vitafoods in Geneva, Switzerland, this past May. The milk beverage is enriched with micellar casein and native whey proteins, as well as calcium. It’s also low in sugar. The lactose-reduced content of these proteins allows for the formulation of products with no/low/reduced lactose claims. For more information, link HERE. So why add dairy proteins to dairy foods? The IFT sessions will explain the premium quality of cows’ milk proteins, as well as the unique functionality these proteins play in product formulations. To read an article I recently wrote entitled “Formulating dairy with dairy” for Food Business News, link HERE. 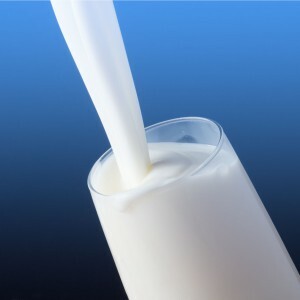 The article discusses the role of dairy ingredients in various applications, including how dairy ingredients can assist with water binding, flavor enhancement, mouthfeel, viscosity, stabilization and more. Here are some recent dairy foods innovations utilizing dairy ingredients to either boost protein content or to improve product quality or both. 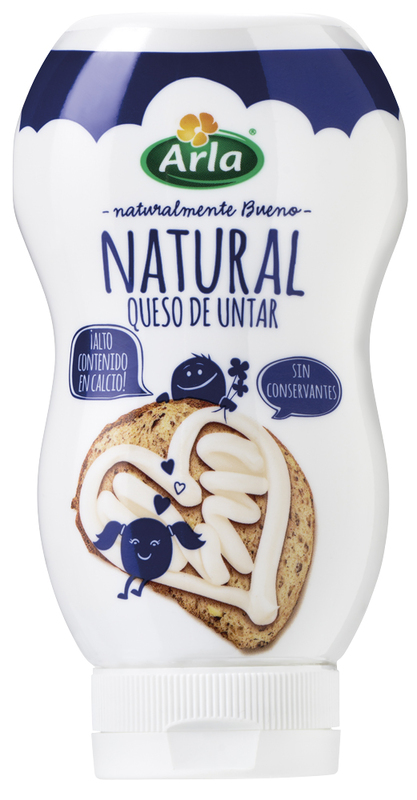 In Spain, Arla offers Arla Queso Fresco de Untar, an all-natural refrigerated squeeze cheese for snacking. 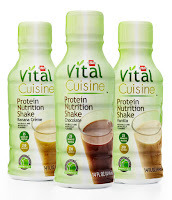 The 175-gram bottles contain a preservative-free cheese made from milk whey, skimmed milk and milk protein, with a 25-gram serving providing 50 calories and 2 grams of protein. 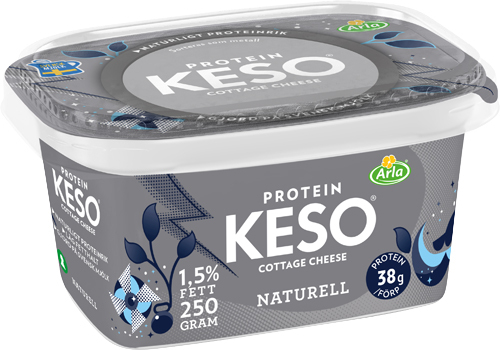 In Sweden, the company markets Protein Keso cottage cheese in 250-gram tubs. Each 100-gram serving of the plain variety contains 80 calories, 1.5 grams of fat and 15 grams of protein, which comes from pasteurized milk and added milk protein. There are also flavored options, including Pineapple & Passionfruit, Fours Kinds of Onion and Grilled Paprika. There’s also snack-size varieties that come with a dome of inclusions. Varieties include Cashews/Pineapple/Orange/Papaya, Hazelnuts/Blueberries/Cranberries, Coconut & Bran Flakes, and Strawberry & Muesli. Hormel Health Labs, a subsidiary of Hormel Foods Corp., is growing its functional dairy foods offerings for the healthcare market. Designed specifically to support the unique nutritional needs of cancer patients, products provide a balance of proteins, fats and carbohydrates. 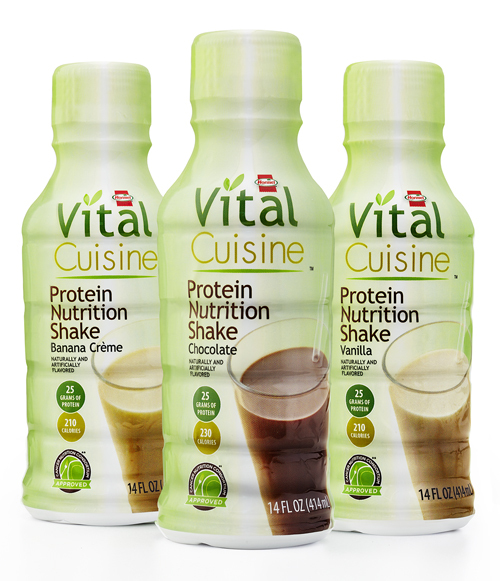 Each 14-ounce Hormel Vital Cuisine nutrition shake provides 25 grams of protein from an array of dairy ingredients, including caseinates, milk protein isolate and whey protein concentrate. Thrive is a nutrition-packed premium ice cream containing probiotics, natural soluble fiber and high-quality milk proteins. It is also loaded with 24 vitamins and minerals. The source of protein is high-quality milk protein isolate. According to the company, Thrive contains all the nutrition and benefits of the typical liquid nutrition shake in a form proven to be more enjoyable to eat. Available in pints and portion-control 6-ounce cups, Thrive can be consumed as a meal replacement, snack or dessert, with healthcare and sports nutrition two key channels for distribution. Varieties are Butter Pecan, Chocolate, Salted Caramel and Vanilla. 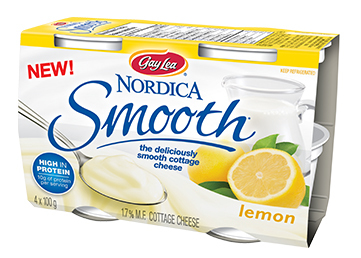 Ontario, Canada’s Gay Lea Foods Co-Operative is growing its Nordica Smooth brand, which is a smooth cottage cheese snack. The product debuted about a year ago in Salted Caramel and Vanilla Bean varieties. Now Lemon is part of the lineup. With Nordica Smooth, consumers can enjoy all the benefits of cottage cheese without the lumpy texture, one of the biggest deterrents to this original high-protein cultured dairy food, according to the company. Each 100-gram cup provides 10 grams of protein, 110 calories and less than 2 grams of fat. The protein comes from milk and added milk protein. 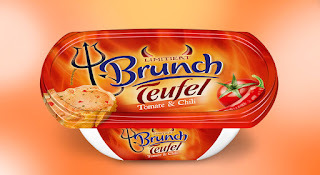 In Germany and Austria, Edelweis offers the Brunch spread line, which combines yogurt with vegetable oil. 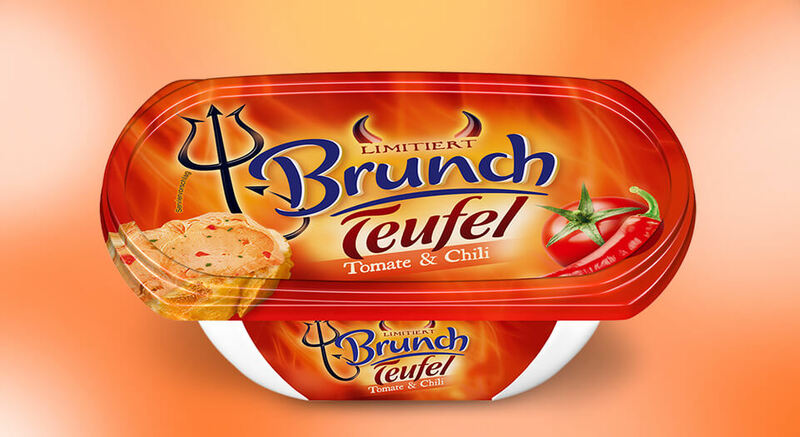 Varieties include Fine Herb, Indian Curry, Sweet That Chili, Paprika & Pepper, and new limited-edition Devil, which is an intensively hot flavor made with tomatoes and chilies. A 25-gram serving provides about 1 gram of fat from the yogurt and added milk protein. Hope to see you at IFT! As the American palate grows more adventurous, global flavors are making their way onto menus of all restaurant types and sizes, as confirmed by a panel of renowned chefs and restaurant owners at the recent National Restaurant Association Show in Chicago. And, as we all know, what starts in foodservice soon makes its way into packaged foods for the retail sector. This includes dairy foods, with ice cream leading the way. A point that stood out during the culinary panel discussion was that the flavor trend should not be referred to as “ethnic,” as this is actually insulting to true culinary professionals. Rather, the term “worldly” is preferred, which was emphasized by Ming Tsai, a celebrity chef and an innovator of Asian-European fusion cuisine. He explained that many of today’s cuisines are based on traditional recipes using authentic cooking methods, and fuse in personal culinary touches that build on flavors to create worldly flavors…not ethnic cuisine, rather worldly cuisine. To read more about the event, link HERE to a Food Business News article. 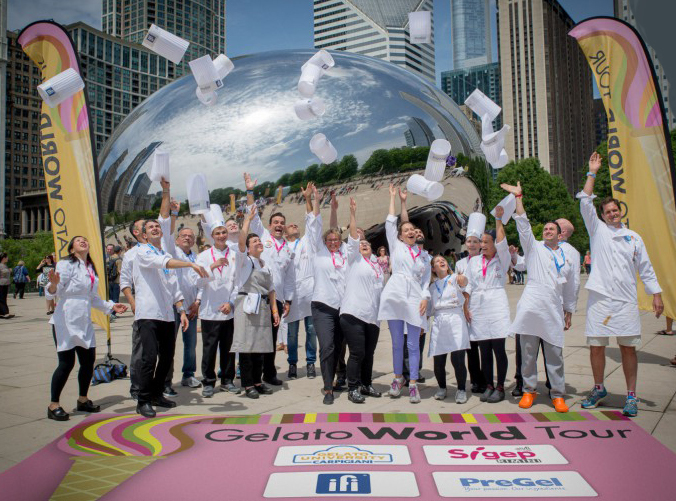 The event was preceded earlier in the week by Carpigiani Gelato University, a gelato-making course hosted by Kendall College Culinary Arts School, Chicago, and taught by Luciano Ferrari, frozen dessert technologist at Carpigiani, Italy. The intense training course ended with a six-course meal at Piccolo Sogno, Chicago. The restaurant’s chef Tony Priolo, and Ferrari, teamed up to create unique sweet or savory gelatos that paired with everything from truffle risotto to braised short ribs to chocolate-covered strawberries. View a Food Business News slide show HERE to get a taste of the pairing menu. 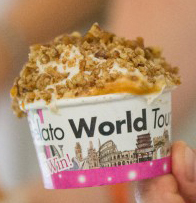 The 16 products served at the Gelato World Tour all have a worldly flavor profile, with many of them possessing hints of floral or savory. Note that many of the concepts tell a story, while others combine comfortable flavors with the unfamiliar. The first place winner--Amor-acuyá--was created by Daniela Lince Ledesma of Dolce Gelato, Medellìn, Colombia. This exotic gelato combined three different sensations: South American passion fruit, which has a sour and sweet taste that binds with the cream; a homemade passion fruit variegate to enhance aroma; and a 65% Colombian chocolate that delivers a strong contrast with its bittersweet taste. Coming in second was Chicago Pothole, created by Angelo Lollino and Ali Caine Hung of Vero Coffee & Gelato, Elmwood Park, Ill. In this fresh take on the classic rocky road flavor, the chefs used a single-origin heirloom cocoa from Ecuador. It was emulsified then variegated with a nutty chocolate sauce consisting of roasted and caramelized pecans, dark chocolate chunks and marshmallow-inspired meringue. The flavor was a tribute to the pothole-infested rocky roads Chicagoans are too familiar with after a long, brutal winter. The third place winner, Tammy Giuliani of Stella Luna Gelato Café, Ottawa, Canada, also gave a nod to Chicago in her creation made with Koval-brand single-barrel organic bourbon. Koval was the first distillery to be built in Chicago since prohibition. Established in 2008 on the north side, the husband and wife founders craft organic whiskey, liqueurs and specialty spirits. Giuliani’s creation combined the bourbon with rich chocolate gelato loaded with ganache swirl and maple-candied pecans. 606: a flavor inspired by Chicago’s many neighborhoods--all with a zip code starting with 606--and diverse food scene. The flavor layers roasted peanuts, sweet coconut, saffron, honey, curry powder, vanilla, ginger and caramelized cashews. By Jessica Oloroso of Black Dog Gelato, Chicago. Balsamic Strawberry Rocks: a Fior di latte gelato lightly flavored with a touch of orange, swirled with a house-made reduced balsamic strawberry preserve with roasted caramelized almond and dark stracciatella chips folded throughout. By Gonzalo Egozcue of GelatoStar, Cleveland. Camembert with Vignoles Plum Swirl: a melding of two cultures manifests itself in this buttery, sweet and slightly salty Camembert cheese gelato with roasted Vignoles red plum swirl. The plum swirl is made with Ozark Premier red plums from Missouri and St. James Winery Vignoles (Rolla, Mo). By Anne Croy and Hollie Powell of Pastaria Restaurant, Clayton, Mo. Canadian Maple Bacon Mini Doughnut: sweet and savory meets the upscale county fair with naturally sweet Canadian maple syrup, Italian sea salt and smoky bacon-infused mini donut-flavored gelato. By Mario Spina and Sharon Woo of Zig Zag Gelato, Calgary, Alberta, Canada. Frost Cookie: the indulgence of cookies melds with the decadent flavors of an authentic creamy Italian gelato. 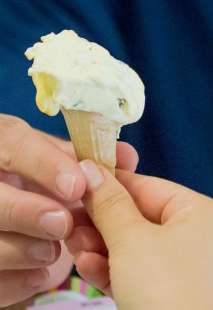 By Nazario Melchionda of Frost, a Gelato Shoppe, Tucson, Ariz.
Honey & Sunflower Biscotti: a biscotti-flavored gelato blended with fresh clover honey gets variegated with roasted and salted sunflower seeds for the perfect balance of sweet and salty. By Linda and Joseph Mercurio of Mercurio’s, Kittanning, Pa.
Magic Carpet Ride: organic black sesame gelato with dark and white chocolate stracciatella, hand folded into marbles of organic pomegranate reduction. The gelato is decorated with pomegranate seeds, fresh toasted sesame seeds and freshly shredded white chocolate. By Tolga Seymen of Nutty Squirrel Gelato, Seattle. Maple: maple gelato made with 100% Vermont maple syrup. By Loris Carlo and Leonardo de Prato of Leonardo’s Gelateria, Barre, Vt. Passion Fruit Ricotta with Candied Walnuts: a whole milk ricotta-based gelato swirled with a homemade tangy passion fruit marmalade. This surprising blend of flavors is topped off with small pieces of crunchy candied walnuts. By Natalie Yepes of Dolci Peccati, Miami. Texas Whiskey Pecan: a recipe rich with the homegrown flavors of Texas native pecans and locally distilled Garrison Brothers’ whiskey. The creamy gelato is then swirled with a homemade whiskey caramel sauce. By Matthew Lee of TÈO, Austin, Texas. Vanilla & Chocolate Hazelnut: a subtle vanilla essence of the Tahitian vanilla bean with pieces of buttery hazelnut and sweet wafers. By Bruno Couto de Matos of Frio Gostoso, Salvador, Bahia, Brazil. Windy City S’mores: a new take on a classic American flavor. Using Chicago’s own Katherine Ann Confections’ marshmallows and rich chocolate stracciatella with a smoked graham cracker milk to get the true campfire experience. By Baron Gottsacker of Bent Spoon Gelato, Sheboygan, Wis.
To follow the Gelato World Tour, link HERE. All of these flavors and similar worldly recipes are ideal candidates for the “when pints cost more than half gallons” movement. This is all about using boutique ingredients and artisanal manufacturing to create worldly flavors. By packaging them in pints or smaller (single-serve) containers, they are transforming the ice cream landscape from being a casual family dessert to a social experience, and commanding a premium price. It’s time to get on board! Millennials are starting to have families. Although the millennial mom grew up drinking fanciful, made-to-order Starbucks beverages alongside her boomer mom, who also let her have a soda with her Happy Meal and a juice box at the mall, the millennial mom would never fathom allowing her youngster to have a nutrient-void, calorie- or sugar-laden beverage…or at least not in public. After all, food and beverage is a form of self-expression for millennials. That’s why millennials love dairy. They know: milk does a body good! They embrace the nutrition, along with the efforts to make milk beverages simpler, cleaner and more power packed. 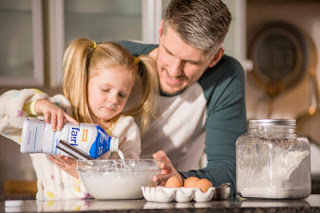 Dairy foods marketers must reach out to millennial moms, who are quickly growing in population size and in spending power. Research shows that millennial moms are willing to spend where they need and want to, with food for their youngsters a priority. According to research presented by Madlyn Daley, senior vice president of strategic insights and evaluation at Dairy Management Inc., millennials are health-conscious and aware of what they are putting into their bodies, and the bodies of their babies. They want simple, clean and local, and dairy resonates with them. Daley spoke to dairy processors and marketers at Midwest Dairy Association’s Chicago installment of “Tomorrow’s Dairy Consumer,” which took place in early May. Just focus on the protein content. Emphasizing the high-quality (contains all essential amino acids in the proportion the body prefers) nature of milk protein makes sense. Vaalia Kids Yoghurt comes in 140-gram refrigerated pouches and is “packed with goodness.” Besides being loaded with protein (7 grams) for growing bodies and calcium for strong bones and teeth, the product contains no artificial colors, flavors or sweeteners and is source of probiotic bacteria “for happy tummies and immunity.” It’s also in a convenient, spill-free, grab-and-go pouch package. Flavors are: Banana, Strawberry, Tropical and Vanilla. This product speaks to the millennial mom. For more information, link HERE. This desire for increased protein makes yogurt and yogurt drinks increasingly attractive to millennial moms. Daley cites data from the IRI custom milk database. 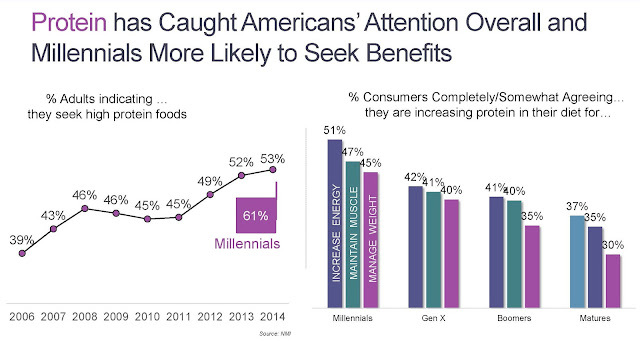 “Ninety percent of millennials buy yogurt, with many strong purchasers of yogurt drinks,” Daley said. Yogurt drinks are portable, convenient and simple nutrition. 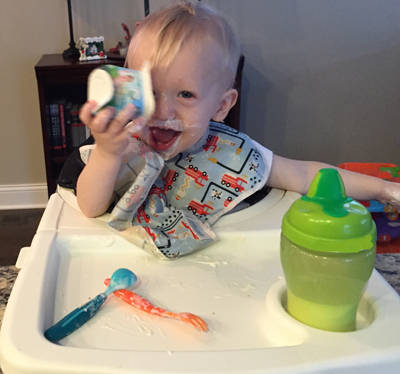 Millennial moms need their protein fix, too, especially during rushed mornings. Moma Yog-Oat Smoothies are perfect for dashboard dining as well as midday snacking. Packed with smooth oats, low fat yogurt and real fruit, Yog-Oat Smoothies are high in protein, a source of fiber and have no added sugar. The 250-milliliter single-serve bottles come in two varieties: Mango & Peach and Strawberry & Banana. Each pack delivers 170 calories, 8.5 grams of protein and 2.6 grams of fiber. 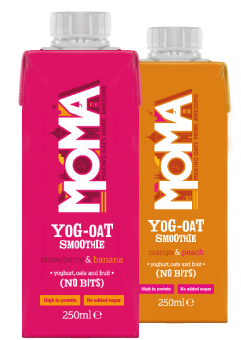 They are approximately 85% yogurt, 10% fruit and 5% oats, along with oat fiber and milk protein. For more information, link HERE. They were the first generation to not have to experience second-hand smoke when attending a 21-or older social establishment. (Remember how bad clothes, hair and coats stunk after a night on the town?) Active wear is considered appropriate casual Friday attire for millennials. (I thought flip flops were for the beach?) They are a health- and wellness-seeking consumer segment who wants to be safe and comfortable. 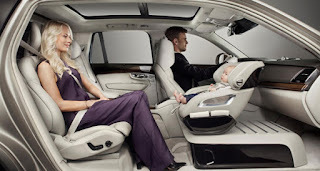 As one millennial mom website explains: We’re fully informed on health and wellness, and with this information many families have adopted healthier lifestyles. A defining characteristic of millennial moms is a commitment to buying healthy foods and products for kids. This presents an incredible opportunity for the drinkable yogurt and nutrient-enhanced milk beverage business. As one millennial mom told me at the recent restaurant show, she gives her picky preschooler a single-serve chocolate fairlife milk to drink on the ride to school every morning. “It’s a milk meal replacement that I feel good about serving my son, compared to some of those other nutrition shakes in the market,” she said. Interestingly, new research from Mintel reveals that 39% of consumers use nutritional and performance drinks as a replacement for breakfast. What’s more, three in five (58%) consumers currently use nutritional and performance drinks as a meal replacement and 48% consume them as part of a meal, up from just 20% who used nutritional drinks as a meal supplement in 2012. In addition to seven in 10 (69%) consumers agreeing that nutritional and performance drinks are a more effective source of nutrients, the majority of consumers agree that they are more convenient (79%) than whole foods. These drinks are also carving out their share of the snacking category, with 80% of consumers viewing them as a great guilt-free snack. Here’s the opportunity: High-protein, lower-sugar real dairy beverages for on-the-go breakfast and snacking convenience. Don’t forget the kid-friendly flavors, convenient package (pouches and tubes make a lot of sense!) and eye-catching graphics.